Looking for a fun and unique option to beautify your party tables this season? I’ve got a dazzling idea that is not only gorgeous, but surprisingly easy on the wallet. This summer, I hosted a family luncheon for my cousins and these succulent favors were the star of the show. 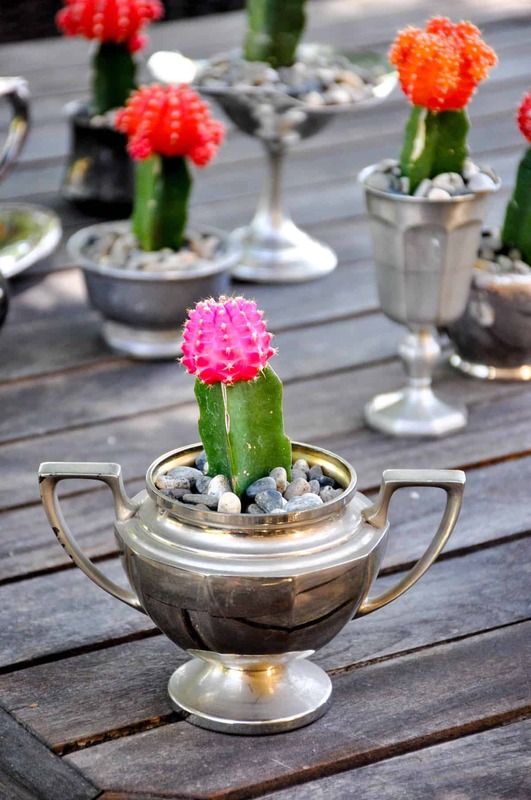 The bright globe on the Moon Cactus is so striking and adds a tremendous pop of color to any table setting. It doesn’t have the traditional sharp spiny needles of cacti, so no need to worry about your guests’ hands as they take them home. Quaint, colorful and easy to care for, who wouldn’t love it as a take-home gift? Want to learn how to create this impressive favor for your next party? I found these California born and bred Moon Cactus at my local garden center and was instantly inspired. Fill the bottom of your container with a few rocks. I filled mine about half way. This method has a two-fold purpose. The first is to add weight to the container and the second is to allow drainage when you water the cacti. Remove the plant form the container and add more soil to secure the plant. Add additional rocks to the top of the container to help secure the plant and to add visual interest. Spray the finished product with a few sprits of water and allow to set. I loved using these sterling silver containers, knowing each one had a story behind it and loved giving them a purpose after so many years on the shelf! Gah! I can’t take the the cuteness! And they make the perfect place to add a place card if needed!